Something odd happened during the stock market volatility we have recently experienced. Practically every asset class moved in the same direction. Gold, every market sector, commodities and Treasurys all moved in similar fashion over the last few weeks, according to a report by Goldman Sachs. This is worrisome because there’s usually a safe-haven place to park your cash. You have to wonder what will be safe when the market eventually crashes. If everything is tumbling during a correction, where should you park your money? Well, don’t let the headlines keep you from diversifying your portfolio. Basically, it is saying all stocks mirrored the CBOE S&P 500 Volatility Index (VIX). Since there isn’t a dark blue bar that is positive, it means everything traded opposite of it. If you know what the VIX is, volatility of the S&P 500, then you know as the VIX rises, the S&P 500 is falling. So if these assets were the opposite of the VIX, it means they too were falling. Again, this is a problem for those of us who diversify to cushion the ups and downs of the market. Clearly, some assets, like the S&P 500 on the right of the chart, had the bigger move. You would have been much better off holding the Japanese or U.S. 10-year Treasurys on the left of the chart. While they were down, it was a marginal decline. To me, this is what diversifying is all about. It’s not necessarily that when one asset declines the other goes up. That is considered a hedge, not diversifying. Diversifying is all about different returns, not necessarily opposite returns. 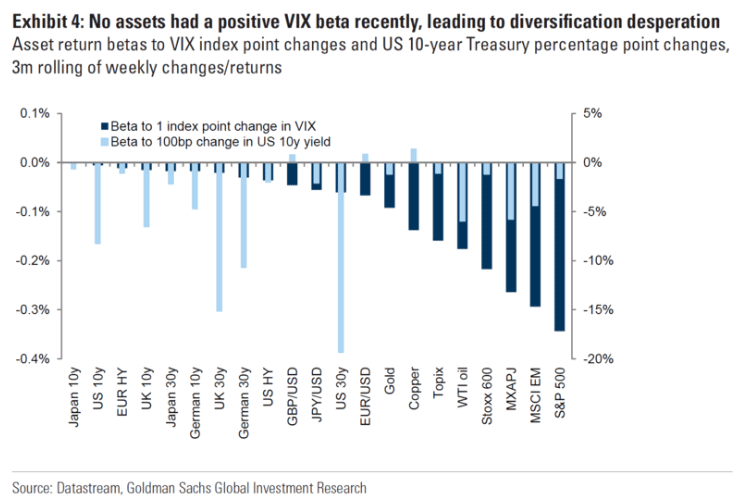 Yet, Goldman’s takeaway from its chart was that diversifying is getting desperate. I think it is working correctly, and there’s no reason to bail on any diversification methods you are using based on the latest stock market correction. The Next Big Bust: When? Why? How Big?